Can one approach the Scriptures without bias? This is a fundamental question that confronts biblical interpreters, whenever they would approach the Bible, because whether we like it or not “we all have certain suppositions or assumptions of the word based upon our prior experiences based on these presuppositions”. 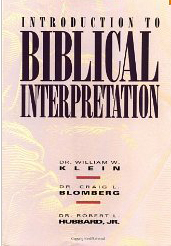 In their book Introduction to Biblical Interpretation, the authors Klein, Bloomberg and Hubbard, defined this phenomenon as preunderstanding: an occurrence upon which knowingly and unknowingly we construct a body of beliefs and attitudes that we use to interpret or make sense of what we experience, which according to them play a very significant role in shaping the way we construe reality –therefore functioning as an arbitrary hermeneutic that we tend to use whenever we would try to draw out meaning at a given text. However the goal of biblical hermeneutics is to bring about an active and meaningful engagement between the interpreter and text, in such a way that the interpreter’s own horizon is re-shaped and enlarged. As preunderstanding consists of the total framework of being and understanding that we bring to the task of living: our language, social conditioning, gender, intelligence, cultural values, physical environment, political allegiances and even emotional state at a given time, construct and govern our individual worlds thus rendering them as the basis which then determines how we as interpreters make sense of the text as the process of interpretation also implies the processing of information that are indeed influenced by the above mentioned factors. That is why the authors rightfully observes that: “it would seem, then, that one may view preunderstanding as either a desirable asset or a dangerous culprit, as whether we like to admit it or not we are often not conscious of our views of reality. It is with this in mind that the author proposes that one of our challenges as interpreters is not simply to identify and take into account our preunderstandings but also to adjust or revise them, or courageously jettison those that prove to be erroneous. For it is in understanding our preunderstandings that we learn to evaluate their worth as we ought to have a basis on which to amend them or judge them unchangeable –that can be found in the Bible. Here the authors challenges us to make a decision about our basic stance in interpreting the Bible, whereupon we are called to engage it from the vantage point of one who is investigating the world of the biblical author along with its intent factoring in the language, culture and other elements that would determine the text’s meaning to its original readers. In recent years scholars have also come to an understanding that such historical method is proven useful only when the interpreter’s focus on recovering what happened or was written in history. If one chooses to ignore the history a biblical text reports and focus on the text only –particularly the interaction between text and reader –then different methods and different conclusions will follow. Drawing from this the authors’ give a survey of the varying schools of thought in contemporary biblical interpretation. From that of the religious pluralist, that grants legitimacy on any manner of interpretation to that of; the existentialist that limit the truth of the word to the corresponding personal experience of the reader; to liberation theology that initiates biblical interpretation from the vantage point of an agenda that is founded on rendering justice for the poor; to that of gender specific readings (e.g. queer, feminist); to process theologians that stress the primacy of change and the fluidity of language; and to that of postmodernists that gives emphasis on a reader-oriented approach upon which focus is given on the contemporary reader’s ‘intending’ of the text that at times makes sense of the text’s meaning that is at times over and against the intended meaning of the biblical author. Noting the above movements in biblical interpretation the authors signals their readers that recent developments in biblical interpretation signal a distinct shift in the practice of biblical interpretation that swings from author-and-text-centered interpretation to reader-centered. Consequently prompting the authors to ask for an objective message conveyed in the Scriptures. In response, to such challenge the authors presents to their readers the approach of ‘critical realism’ which approaches interpretation starting from that of a given hypotheses that the interpreter’s must test as and either accept or reject thus evaluating historic Christian truth claims in light of all alternative truth claims. Such an a approach therefore establishes the the viability and defensibility of the historic Christian faith. As it establishes Scripture as the grounding filter upon which we must put all philosophical claims for our faith to test. Correspondingly, as responsible interpreters we are called to seek and employ rational whatever rational methods that will enable us to understand the correct meaning of the biblical texts. It is in this critical engagement that the authors now calls upon their readers to anchor our subsequent discussion of how to understand the text to our previous discussion of preunderstanding –that is to be in constant critical conversation with the Word –hence communication! It is in this hermeneutical spiral that the interpreter finds his/herself in the position that they would be reflective and open to change and even to a significant transformation of preunderstandings. Since we accept the Bible’s authority as mediated through the Spirit, we remain open to correction by its message. As our goal as interpreters is to seek out the definite and fixed meaning intended by the author of the text and to use Scripture as the final critical authority for judging extrabiblical thought-patterns. As a concluding note the authors quotes D.S. Ferguson who acknowledges that: “all knowledge is elusive, and to grasp it demands a great deal of effort on our part, not the least of which is keeping a watchful eye on our own personal and societal preunderstanding.” Acknowledging that we can never fully put our biases apart from our interpretation puts us only at the mercy of putting these biases to the test against what the word reveals and that it is in our openness as interpters to revise our or ultimately remove this biases that we are put into a healthy approach and an adequate comprehension of the Bible. This entry was posted in Biblical Studies, Summary and tagged Biblical Interpretation, Craig L. Bloomberg, Frank Dance, Hermeneutical Spiral, Hermeneutics, Robert Hubbard, William Klein by Chuck Baclagon. Bookmark the permalink.